My skin is weird. One day it can be super dry but then the next day it might decide to be oily for a while. Because of my skin's weirdness, I have a wide array of skincare products and out of all the vegan and cruelty-free skincare brands that I've tried over the years, one in particular has been great for my skin especially in it's times of weird and that brand is Acure. 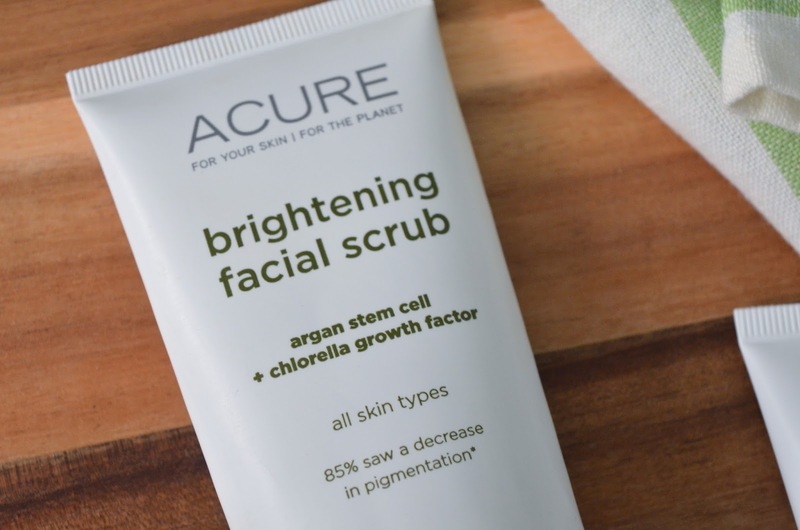 Acure is a cruelty-free brand with a wide variety of vegan products. Unlike other brands that make you attempt to read the long list of unreadable ingredients in order to see if a product is vegan, Acure states whether or not a product is vegan right on the packaging and in the description on their website which is such an incredible and handy little feature that makes my shopping experience a whole lot easier. Other brands - take notes. 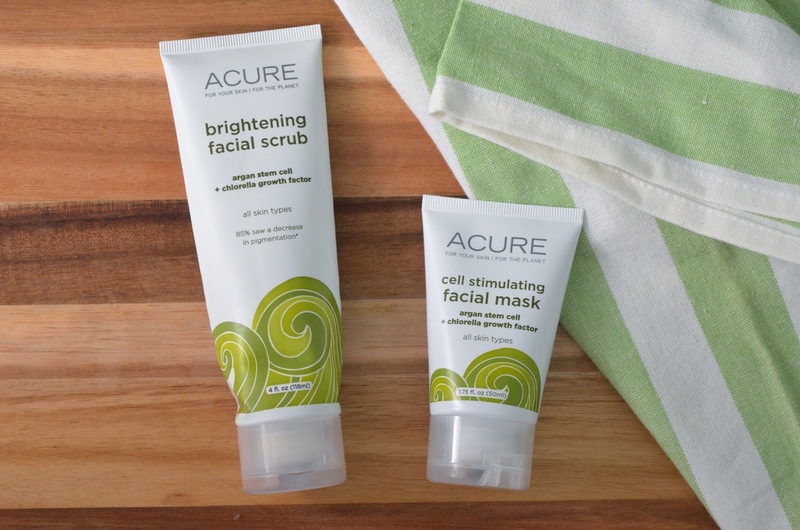 Out of all the products Acure has to offer, there were two products in particular I knew I had to try - the Brightening Facial Scrub and the Cell Stimulating Facial Mask. Both products contain argan cell stem and chlorella. Though I'm still not 100% sure what argan cell stems are and how they would help brighten your skin, I was, and still am, intrigued. On the other hand, I knew chlorella is a type of algae which interested me even more. Along with the interesting ingredients, the idea that both of these products might actually be green (which they totally are, by the way) when buying them made me want them even more. I'm not sure why, but I like wearing face masks that are brightly colored. It's even better when those bright colors are from natural ingredients. Since I've never seen skincare with ingredients and colors quite as interesting as these, I had to buy them and test them out. The first of the two products I tried was the Brightening Facial Scrub. Like the ingredients, the scrub itself was interesting. Instead of the artificial exfoliator beads you would normally get in most scrubs, you can tell this scrub contains natural exfoliators. Also, on the tube it states "85% saw a decrease in pigmentation" which is a nice little added bonus. I haven't used it long enough to recognize a decrease in my acne scar/hyper pigmentation spots yet, but I'll be sure to mention if I do. Next I tried the Cell Stimulating Facial Mask and I loved the application. Unlike other masks that don't really feel like they're doing anything other than sitting on top of you skin and leaving you unable to move your face muscles for a few minutes, this mask felt like it was actually doing something to my skin. As the fifteen minutes went by, I felt as if most of the product had made it's way into my skin and left it felling hydrated, even while wearing it. Rinsing the mask off felt like a whole other product in itself. The mask started to get sudsy under the water, so really I got a mask and a cleanser from this one product. 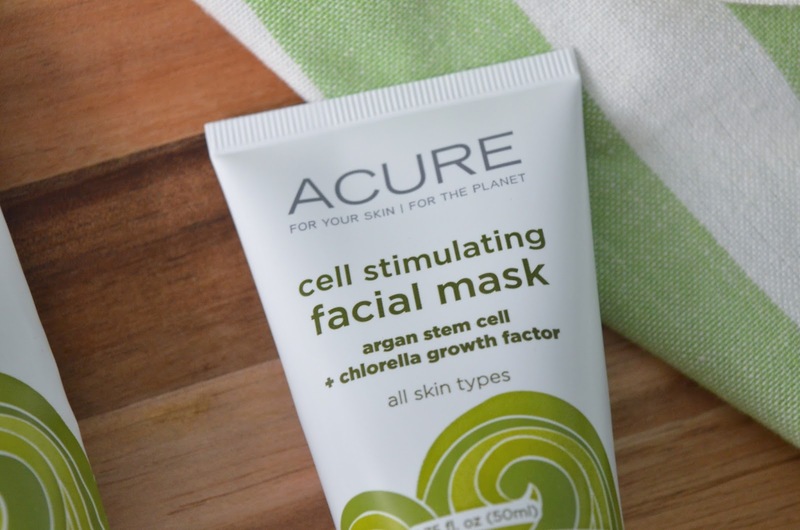 What's your favorite Acure product?